The broadcasts will continue to be heard on one of the most powerful ‘triple-casts’ in the NFL, with a Flagship Station lineup of 700 WLW, 102.7 WEBN and ESPN 1530. The 50,000-watt ESPN 1530 and 102.7 WEBN will serve as the broadcast flagship stations for all Bengals games. 700 WLW will also carry all games for which there is no conflict with Cincinnati Reds baseball broadcasts. In addition to airing games, iHeartMedia Cincinnati broadcasts Bengals weekly radio shows in season, including Bengals Line, Bengals Game Plan and Bengals Pep Rally. “We are incredibly excited to continue this long relationship with the Bengals. With this partnership we offer fans the ‘Best Bengals Coverage’ across our different platforms whenever and wherever they want it,” said DJ Hodge, Market President for iHeartMedia Cincinnati. 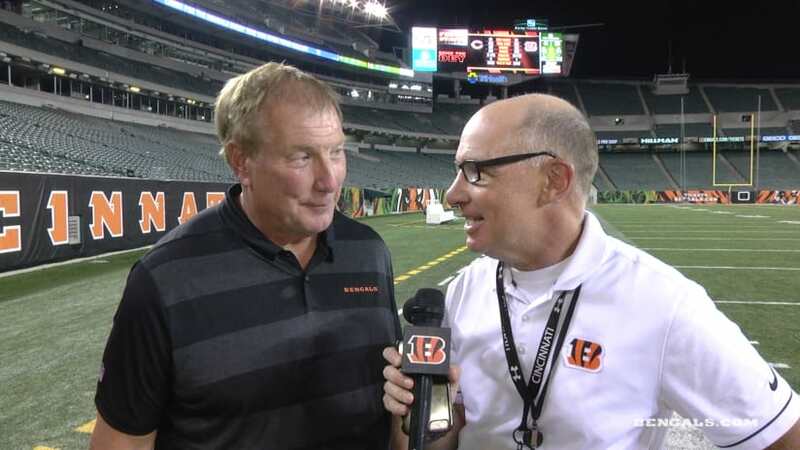 Dan Hoard and Dave Lapham return to the radio booth for Bengals games this season. Wayne Box Miller serves as pregame and postgame host. Hoard, a former sports director and broadcaster on WXIX-TV (FOX 19) in Cincinnati, is in his ninth season as the radio play-by-play voice. He also is the radio voice of University of Cincinnati football and basketball, and he has prior experience as the play-by-play voice on Bengals preseason TV. Lapham, a Bengals offensive lineman from 1974-83, is in his 34th consecutive season as the analyst on the team’s radio broadcasts. In past years, Lapham has been an analyst for NFL games on both NBC and FOX, Big 12 games on FOX and the NFL Europe League’s World Bowl game on Sporting News Radio. Miller is a recurring guest host for Bengals Pep Rally, which airs on ESPN 1530 on Friday afternoons throughout the season. His credits include producer and host of the award winning Prime Time Sports Show on radio and he was part of the inaugural Sports Rock TV show. In addition, he opined The Box Seat sports column in print and online platforms. Miller is a graduate of Morehead State University, and was inducted into the Alumni Hall of Fame in 2007.